First I must appologize for not having inprogress pictures of these installations. I will try to describe how it was done and if you look at the finished pictures you should be able to understand this construction process. Here are before and after pics. All of the replacement metal was 14 gauge cold rolled steel. I know that seems a bit on the thick side but I like to build a strong structure and since this truck won't see any racing I opted for "Industrial Strength" metal. If you look closely you can see the floor sections were pretty well gone as well as most of the "A" pillars. 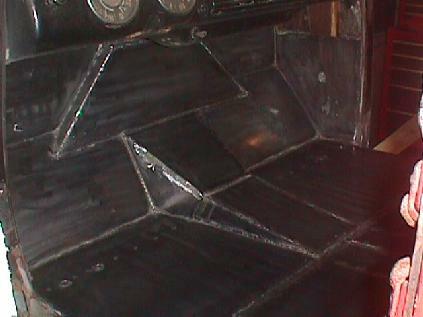 A pair of patch panels from Chevy Duty (the gray panels) were welded in place replacing the original panels prior to removing any of the rusted out sections of the floor or firewall. These panels were then used to locate the rest of the replacement metal. This helped to keep the structure straight and aligned properly during the entire process. A word of caution here... 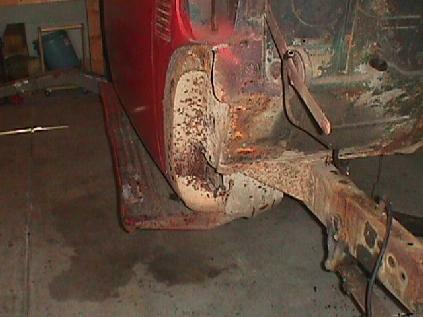 When ever you're working on major metal replacement on a body make sure you tack weld braces in place to hold the door pillars in the correct location first. If you fail to do this you may very well wind up with doors that won't fit when you're done. I welded three braces on each side one across the top of the door just below the window area and the other along the bottom. I then used a cross brace to form a simple "Z" shape. Strong and efficient. The braces were made of 1/2" square steel stock. When the metal replacement was completed the doors were test fitted and everything had remained in it's proper place so the doors fit correctly. 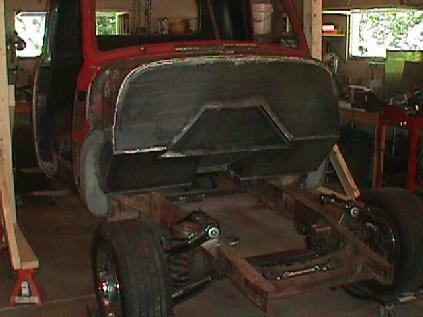 The old firewall was cut out leaving a 1/2 inch lip all the way around. Then I used a pair of flanging vice grips to make a recessed flange out of the lip so the new firewall would fit flush. 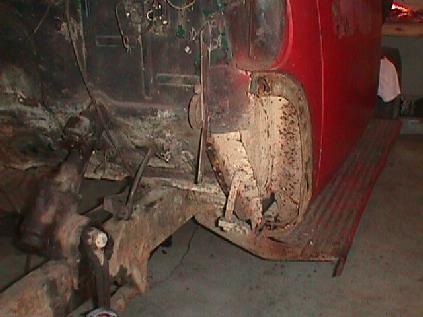 Once the metal was cut it was fitted in position and welded to the flange. All that is needed is a thin coat of filler at the seam for a professional looking installation. 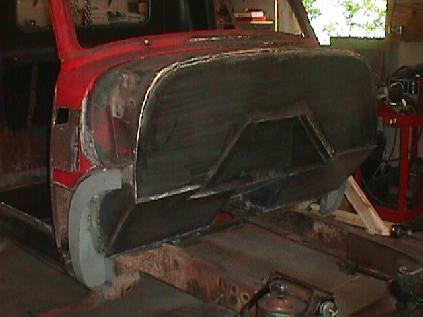 After the firewall was in place the hemi block and TH-350 trans were fitted in position so the proper recess could be marked and cut into the new firewall. 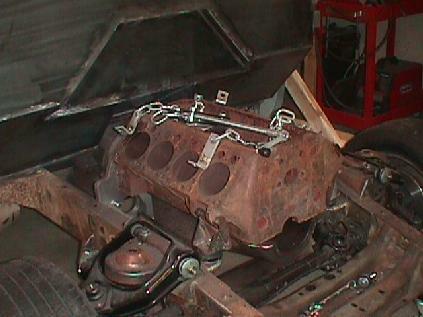 The heads were mounted on the block along with the valve covers and a relief was marked in the new firewall for a recess that will insure adiquate clearance between the heads, block, distributor and the firewall. This area was then cut out and a 2" recess was fabricated and welded in place. Here you have the finished product from the inside. 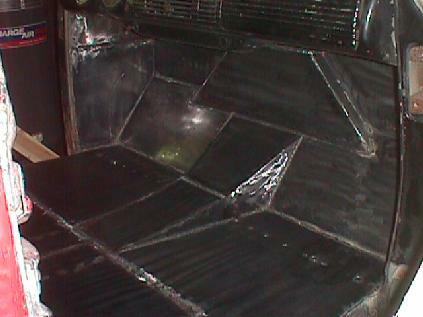 You can see a line of spot welds across the front of the floor. There is a 1"x2"x1/8" steel crossmember that acts as a front cab mount that runs completely across the cab at this location. there is another crossmember that runs across the cab just behind the trans tunnel. There are also several 3/4"x3/4"x1/8" angle braces that run between the two major crossmembers for strength. 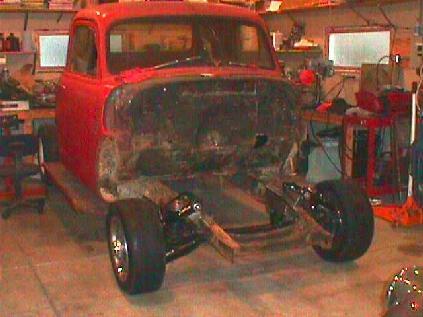 The new floors and bracing were anchored to a stock crossmember at the rear of the cab. This piece was still good so there was no need to replace it.